Today my male offspring made a gruesome discovery. 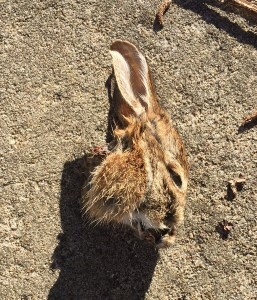 Something (or someone) had left a decapitated rabbit’s head at the bottom of our driveway. As you’ll note in the photo evidence he took (Exhibit A), there is no blood and there are no jagged gobbets of flesh around the severing wound. This was a clean cut and it appeared that perhaps the harried hare had possibly even been exsanguinated. According to Wesier’s Field Guide to Witches, “Rabbits serve as witches’ familiars and messengers and were believed to be the form into which witches most frequently transform.” Further research tells me that witch hunters believed that killing a witch while it was in animal form would prevent the witch from passing on her skills to the next generation…which I can only assume is because she is dead? So, you don’t believe I have a witches’ coven in my sleepy little neighborhood? Maybe you are right. But what about the distinct lack of blood and the fact that it was placed directly in the center of our driveway, as if it was a warning to all who entered our property? 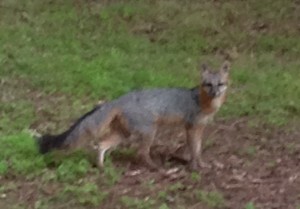 Maybe one of my neighbors is a bloodsucker with a penchant for four-legged appetizers. Now, just to add some creepy sprinkles to the mix: after he found it, my son put on gloves and moved the head out of the way (so my female offsprings wouldn’t see it) and left it for me to inspect when I got home. He placed it on top of a three-foot tall stump, near the top of our driveway. Only two hours after the initial discovery, I arrived home from work, only to find said stump empty. Did a determined, stump-scaling fox get it? Perhaps. And lest I be called biased, I will even post for you a photo (Exhibit B) I took last summer of the elusive red fox who has been known to chill in and around our yard. Yes, there are several different and plausible explanations that do not involve the undead or the occult. But no self-respecting horror writer would miss a chance to jump to the most evil of conclusions. But if said fox wanted the rabbit head, why did he leave it in the first place? There’s no meat…and there wasn’t even any blood. Perhaps he was just bored or territorial. Or perhaps…it was something much more nefarious.